Chennai – a city best known for its spectacular temples, historical monuments, Carnatic music, aromatic filter coffee, flavorsome dosas, and gorgeous Kanjeevaram sarees and much more! Dotted with various attractions across its length and breadth, Chennai draws tourists from all across the world. One such attraction is the picturesque waterfalls situated in and around the city. With the pleasant environment, scenic vistas, and splashing water, these waterfalls are sure to leave you thrilled with ecstasy. So, are you traveling to the capital city of Tamil Nadu and wondering where to find these cascading beauties? Here, we have penned down a list of waterfalls near Chennai that promises you a refreshing day out with friends and family. Go on and take a dip! Located in the dense forest of Siddulaiah Kona, Tada Falls, also known as Ubbalamadugu Falls is a popular destination among travelers and adventure seekers. You are sure to get awe-struck by the beautiful view of this cascade tumbling down from a height of about 330 feet and making a gush around the rocky hillside. 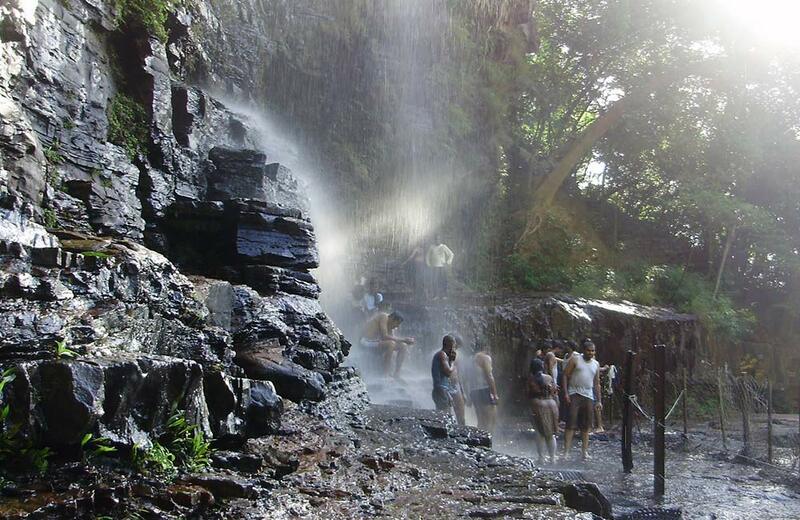 This place offers you an adventurous trekking experience of nearly 10 km to and from the falls. Those who fancy some sightseeing can also visit the Siddulaiah Shiva Temple and Pulicat Lake situated nearby. But remember, this is a place clearly for the swashbucklers and not the faint-hearts. 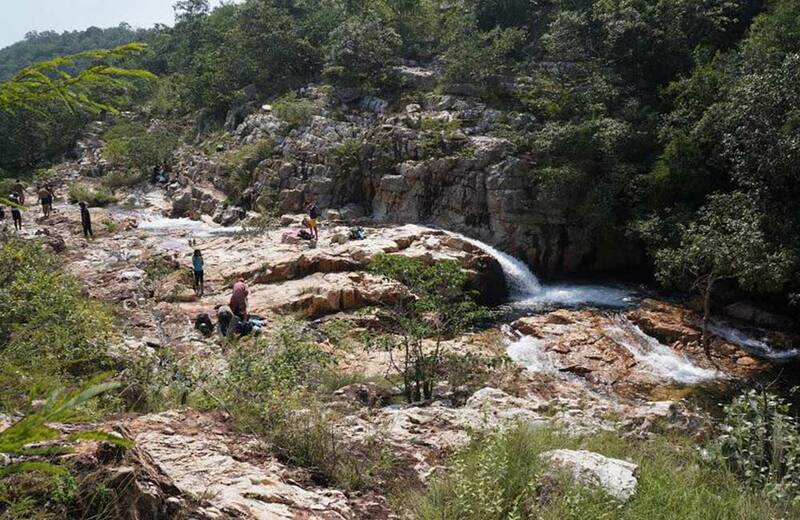 As one of the most accessible waterfalls near Chennai-Andhra border, it has become a favorite getaway destination among people from both these states. There are plenty of transportation services running from Chennai to Tada Falls on a daily basis. 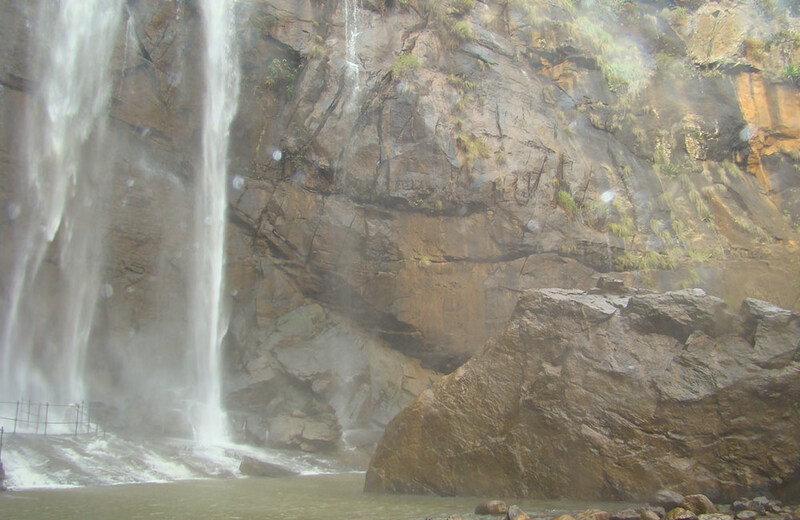 So wait no more, gear yourself with some hiking shoes and explore the spectacular beauty of Tada falls, near Chennai. 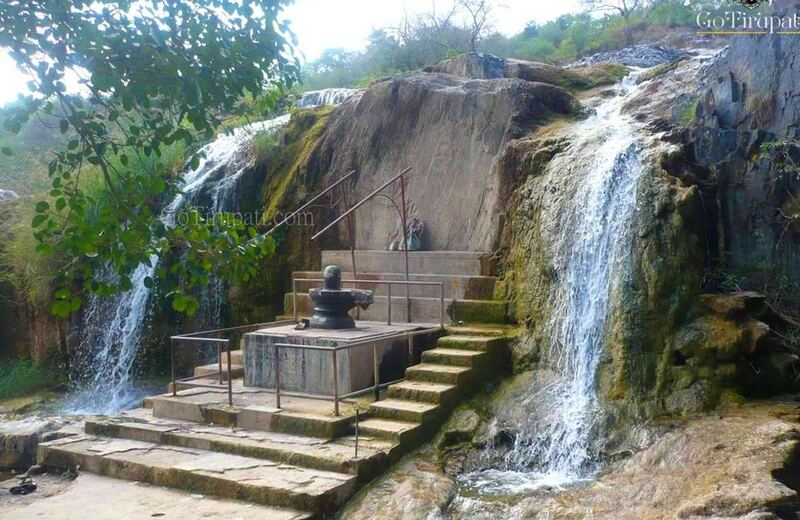 Situated in the valley of Nagari Hills, this is one of the famous falls near Chennai. It is a small cascade that starts from a split in a rock, outpouring itself from a height of 40 feet above the ground. 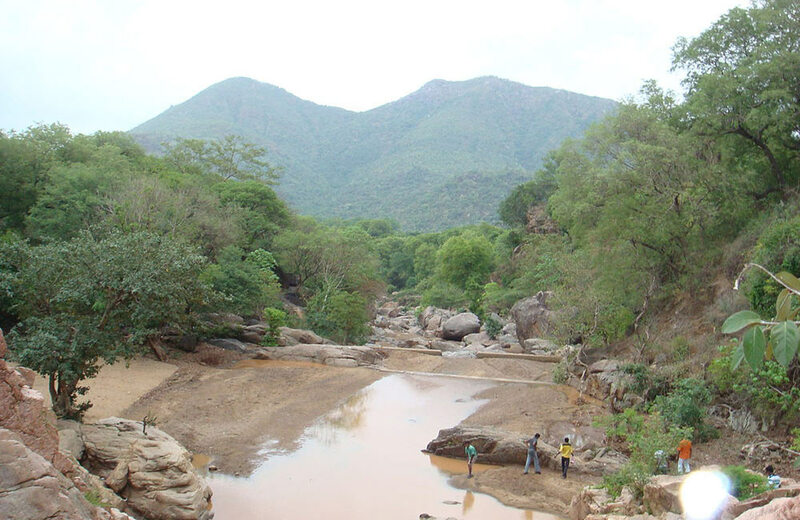 The Kone Falls near Chennai is famous for its rejuvenating baths as the water here is pristine and clear and is presumed to possess medicinal properties that heal any ailment. The small temple located near the waterfalls is dedicated to Lord Shiva and Parvati, making this place a point of religious importance as well. With all these attractions and easy accessibility, this perennial cascade is a perfect spot in your itinerary for a one-day tour near Chennai. 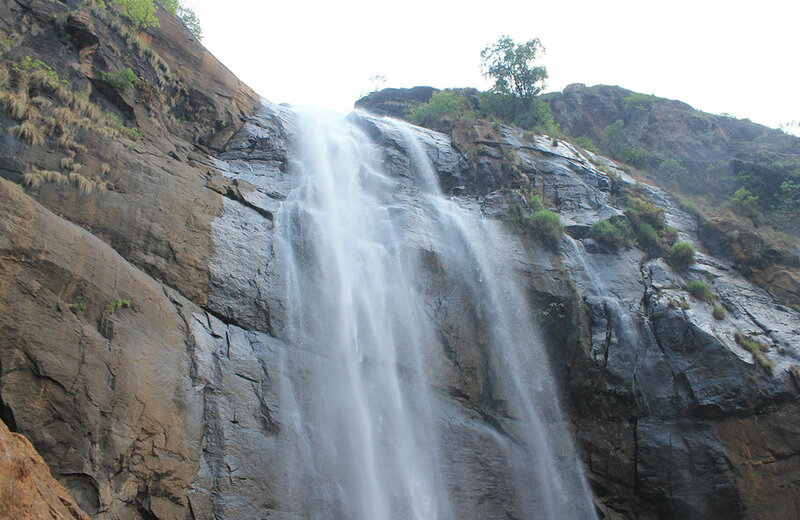 Descending from a height of 270 feet, Talakona Waterfalls is the highest waterfall in Andhra Pradesh. Located in the Nirabailu village in the Venkateshwara National Park, it is a great place to visit with your friends and family on a long weekend. Even a splash of its pristine water can refresh you with its healing properties. The Lord Siddheswara Swamy Temple, located close to the waterfalls is another major attraction of this place. There are many hotels providing accommodation around the falls to help you enjoy the wholesome beauty of this place. So in many ways, Talakona Waterfalls near Chennai is an ideal destination for a short trip, perhaps for one or two days. Interested to know more about places near Chennai for refreshing jaunts? Check our blog on short trips near Chennai for some great ideas. Kaigal Waterfalls, locally known as the Dumukuralla Waterfalls, is situated right in the middle of the Koundinya Wildlife Sanctuary. Though Kaigal Waterfalls is a natural and perennial one, its sheer strength and beauty doubles during the monsoons. The Shivalinga installed near the falls proves to be a major attraction, especially for devotees during the Shivaratri Festival. If you are a worshipper of Lord Shiva, make it a point to visit the falls during the festival. You would be required to walk through the trails in the dense forest to reach the falls from the Palamaner-Kuppam Highway. So, pack your bags with the trekking essentials and put a fine pair of sneakers on, and off you go into the woods! Surrounded by the Amirithi forest along the Javathu Mountains, this small cascade is a popular place of attraction among tourists and backpackers. You can reach the cascade by trekking from the entrance for about 1.5 km through the rich flora and fauna of this zoological park. This waterfall forms a pristine pool at the base for travelers to relax and unwind in its tranquility. Remember that Amirithi Falls is a seasonal cascade and the best time to visit it will be post-monsoons. Situated on the foothills of the Kolli Hills, Puliyancholai is a terraced waterfall surrounded by tamarind groves and rich green flora, making it a famous haunt among the travelers. Cascading through the Small Rocky Mountain, this scenic beauty enlightens your body and mind with its serenity. You can imbibe all the medicinal elements by enjoying a bath in its natural springs. There is a Lord Shiva temple which is thronged by people on all auspicious occasions. Indulge yourself in this splendid beauty of nature, which is also a great choice for an enthralling weekend getaway. Dropping down from a height of nearly 65 feet and paving its way through 14 channels along the lofty landscape, the famous Hogenakkal Falls is yet another must-visit place for Chennaites and Bangaloreans alike. 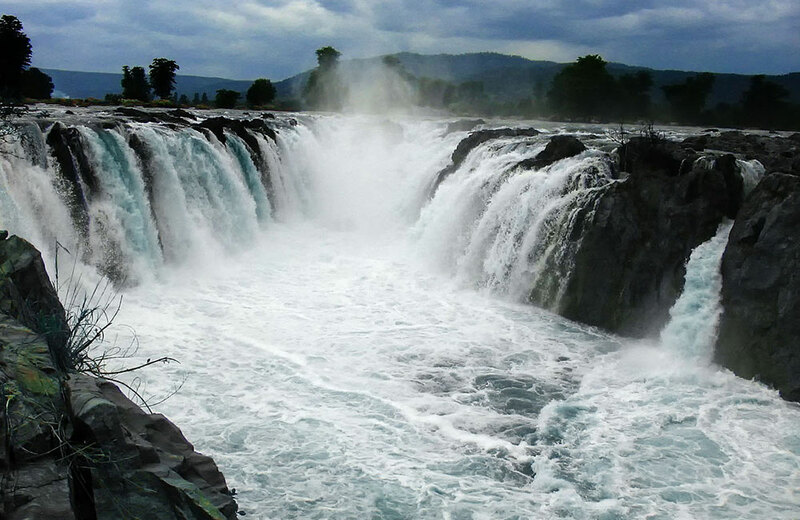 Located on the Kaveri River, this unique majestic beauty is sometimes also referred to as the Niagara Falls of India, and for all the right reasons. The place gets its name from the Kannada words “Hoge” and “Kal” which, when translated, mean “Smoky Rocks”. Due to the force of water falling from a great height, a smoke-filled aura forms around the rocks, which is delightful to watch. During the dry seasons when the falls are not strong, you can enjoy the coracle boat ride from one end of the river to the other. With some medicinal and healing properties, a dip in this waterfall is believed to revitalize your body and soul. Also, don’t miss out on the fresh fish fry and other seafood dishes from the stalls nearby to satiate your hunger pangs. Did you know that Hogenakkal Falls is just 3 hours ride from Bangalore? Want to know more about such magnificent waterfalls for an amazing jaunt near the Garden City? 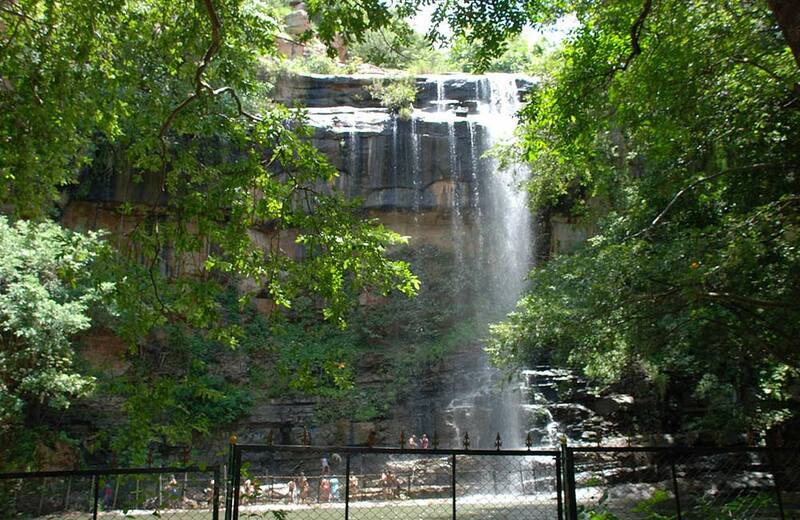 Read our blog on the waterfalls near Bangalore to know more about your options. Feel enchanted by this rugged beauty amidst the Kolli Hills of the Eastern Ghats. Cascading from a whopping height of 300 feet and formed by the River Aiyaru, Agaya Gangai Waterfalls appears like the Ganges of the sky, quite true to its name. You can reach the falls by climbing down about 1050 steps or by a five-hours-trek through Puliancholai, so you can choose a route based on your preferences. Surrounded by a scenic valley, this majestic beauty can be enjoyed at its best immediately after the monsoons. 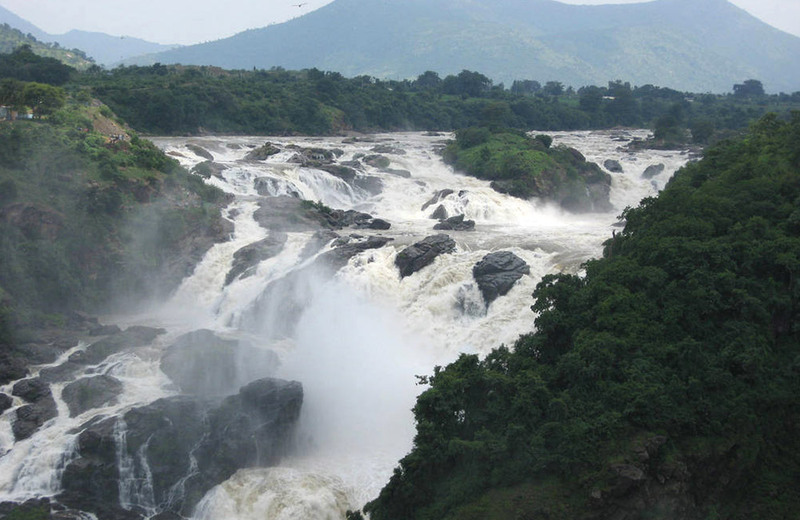 Situated on the Kaveri River, the Shivanasamudra Waterfalls near Chennai is a segmented waterfall with several streams flowing parallel to each other, offering an incredible view to the visitors. Cascading from a height of around 320 feet, this waterfall has Asia’s first hydroelectric power station. Swimming here is not permitted due to deep ravines and strong water currents. 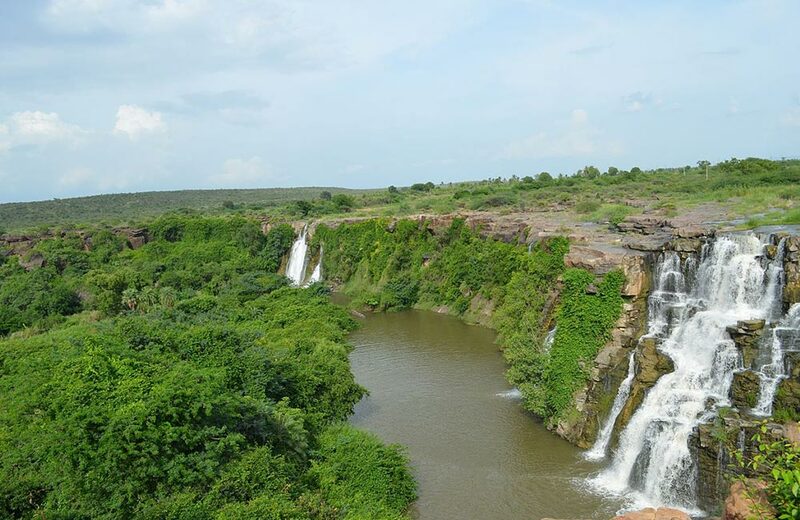 Even then, the mere view of Shivanasamudra Waterfalls can leave awestruck with its beauty. Located at a distance of about 130 km from Bangalore, this is one of the favorite getaway destinations among Chennaites as well as Bangaloreans. Want to know more about the splendid destinations near Bangalore. Check out places to visit near Bangalore for more details. Planning to visit the great Nagarjuna Sagar Dam? Then you cannot miss out on this sheer beauty of nature called Ethipothala Waterfalls. Descending from a height of 70 feet into a lagoon, it is formed by merging of three streams, namely Chandravanka Vagu, Nakkala Vagu, and Tummala Vagu. The water released from the Nagarjuna Sagar Dam into the above stream keeps it perennial throughout the year. You can watch this glorious waterfall from the observation deck maintained by APTDC, from where you can also get a clear view of the crocodile breeding center near the lagoon. Fascinating right? Surrounded by the dense forest of Nallamala, Mallela Theertham Waterfalls cascades down from a height of 150 feet, making it a delight to watch for the visitors. With an entry fee of ₹ 10, you can enter the premises and from there, a path of 350 steps leads you to this splendid waterfall. With beautiful vistas all around, you can thoroughly enjoy nature here to the core. 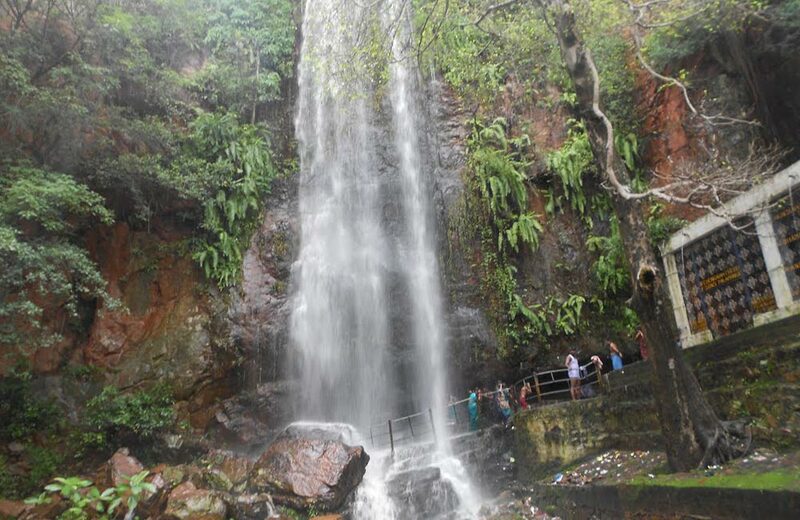 As the roads get muddy in the monsoons and water is scarce during the summer, the ideal time to visit the waterfall would be from October to February. Remember, swimming in the falls is not recommended due to the slippery rocks. So next time you plan to break out of your monotonous city life for a fun-filled getaway near Chennai, don’t forget to include some of the above-given waterfalls in your itinerary. Get close to nature, wash your worries away, and cool off your summer-weary mind in these marvelous cascades. You can check in at one of the best budget hotels in Chennai and start exploring the city and the attractions in and around it. Chennai has no dearth of places to visit for unlimited fun and frolic, so preparing an itinerary could be a tiresome task. You can check our blog on the best places to visit near Chennai for some great ideas.